On 15 July 2015 my husband and I travelled to Episkopi to interview a Greek-Cypriot couple from Agia Irini – Kostas and Irini. Kostas is my uncle Iordanis’ childhood friend and koumbaro. James and I were told to go to a pharmacy to ask for directions when we arrived in Episkopi, a lady drew us a map and we eventually found the house. Before 1960, Kostas said, Agia Irini was a mixed village of roughly fifty percent Turkish Cypriots and fifty per cent Greek Cypriots. However, as more and more Greek Cypriots married and moved to larger cities, by 1960 the Turkish Cypriots became the majority. Both Irini and Kostas spoke Greek, English and a little Turkish growing up. Most of the Turkish Cypriots spoke Greek, so there was not such a need for them to be fluent in Turkish, but they knew enough to have a general conversation with their fellow villagers. Both recall Turkish Cypriots visiting the church in the village, however Kostas, who had entered the mosque growing up, said that only Greek Cypriot men were allowed in the mosque back in those days. 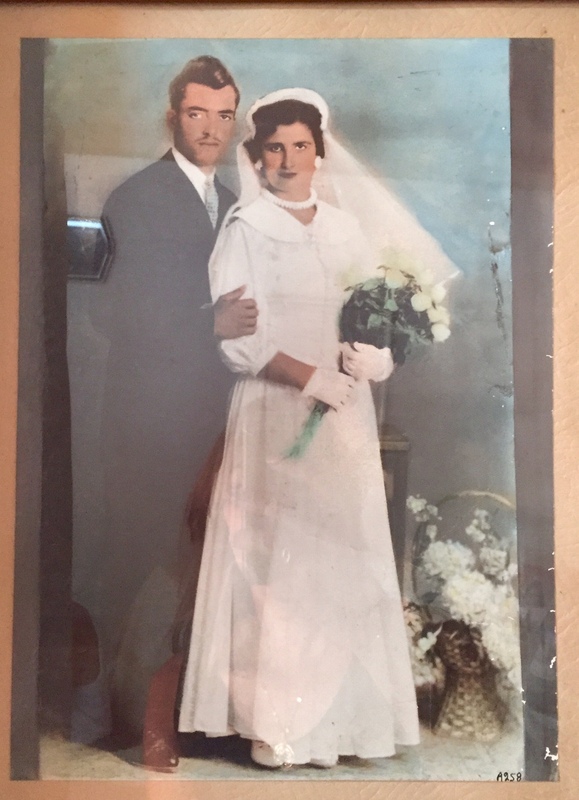 When the war broke out in 1974, Kostas and Irini fled to Pethoulas and three years later settled in Episkopi. Since the border opened in 2003, they have travelled north many times, usually to see their Turkish Cypriot friends in Agia Irini.“There is still lots of love”, Kostas said. Two days later, on 17 July 2015, we visited Kaiti, another friend of my uncle Iordanis, also from Agia Irini. We visited her in her chicken shop in Lefkosia. Kaiti is a warm and generous woman whose family had very strong ties with the Turkish Cypriots of Agia Irini. “We hosted a Turkish Cypriot wedding at our coffee shop”, she said. Kaiti’s mother was a milk-mother to a Turkish Cypriot child; “Relations were by milk”, she said, and “their children were like siblings”. She also recalls that Greek and Turkish Cypriots would be koumbaroi (groomsmen/bridesmaids) for one another, “there were more Turkish Cypriot koumbaroi for Greek Cypriots than vice versa”. She recalls that a Greek Cypriot koumbaro would put henna on the Turkish Cypriot groom and that the weddings went for three days. The koumbaro would pay for the Monday celebrations. Kaiti remembers that for parts of the wedding celebrations men and women were separated; a male musician would play music for the men and another, who was blind, would play music for the women. Kaiti also recalls that Turkish Cypriots would often bring candles and oil to the church, but many did not enter. Whilst Kaiti’s father spoke fluent Turkish, she only spoke a little. Kaiti recalls Turkish Cypriots attending the Greek school in the village but no Greek Cypriots attending the Turkish school. She has visited Agia Irini five times since the border opened – her Turkish Cypriot friends always put on a big lunch for her. Her Turkish Cypriot friends also visit her in Lefkosia, often! Kaiti has maintained a strong relationship with many of her Turkish Cypriot friends and neighbours, especially with her milk brother.